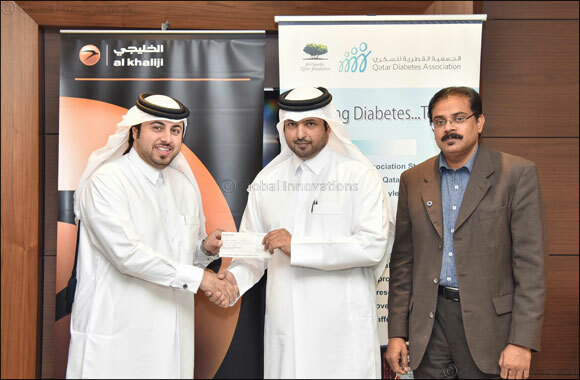 Doha, November 28, 2016: On the occasion of World Diabetes Day, Al Khalij Commercial Bank (al khaliji) P.Q.S.C, Qatar’s next generation bank, in association with the Qatar Diabetes Association (QDA), recently organized a Diabetes Awareness Session entitled “Risk Assessment program”. The event highlighted the importance of screening as an early detection mechanism for widespread chronic disease, and provided the bank’s staff with nutrition counselling and lifestyle tips that help with prevention and treatment. al khaliji presented a donation cheque to the QDA team, to assist in raising awareness. The initiative came as part of al khaliji’s continuous efforts to support the community it serves while committing to its multi-faceted Corporate Social Responsibility (CSR) program, which contributes to the achievement of the four pillars of the Qatar National Vision 2030, and its emphasis on human and social development. The bank consistently demonstrates its commitment to community development in Qatar, and will continue supporting initiatives and programs that raise public awareness of important social issues.